Discussion in 'Diseases & Injuries - Goats' started by aisha3789, Oct 29, 2018. I have a young buck that's about 8 months old that i recently purchased. He had an annoying cough but it was only a few times a day and he was happy and healthy. He was very active and eager to eat and when I looked at his eyelids they are a healthy dark pinkish red color so I thought if he had lung worms they weren't bad enough to cause him anemia. I assumed he just had the cough from road dust after being trailered to my home. (I live in an extremely dusty and dry area). My question is about how he acted after the medication. He keeps leaning his head sideways and shaking it and stands in one place for a long time very still. I gave the injection in the neck because he is intended as a meat goat so i avoided the hips and shoulders for a reason.I don't know if I am just being a nervous Nelly or if he just feeling yucky since he had all the meds. 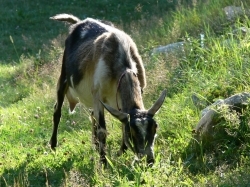 Giving aspirin to a goat with possible high wormload and a dewormer is not desirable. This can cause internal bleeding. It says you are from pakistan. I don't know what kind of vets you have where you are but I would consult with one if you are able. Listeria can cause high fever sometimes and cause a staring off and stillness. This requires ecrtain meds that are prescription. Goat Polio doesn't generally cause fever but will cause staring off early on in that case you need thiamine. Probably just a respiratory infection, have the antibiotics helped?